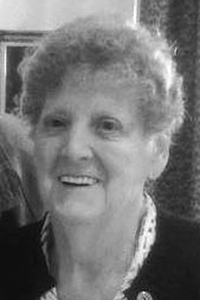 LEWISTON – Alice B. Gunn, 86, of Lewiston, died Wednesday, March 20, 2019 at her home, with her loving family at her side. She was born in Lewiston on Nov. 2, 1932, a daughter of the late Romeo and Flora (Rancourt). She was educated in local schools. Alice worked for many years in local shoe shops, most of those years at Clark Shoe and Acorn Slipper. She married her true love, Donald E. Gunn on May 15, 1954. Alice was a member of Holy Family Church. She enjoyed sewing, knitting, crocheting, traveling and most of all, just being with family. She is survived by her loving husband of almost 65 years, Donald Gunn of Lewiston; her three children: Debra Gunn of Auburn, Donna Stowe and husband, Tom of Mechanic Falls and Dennis Gunn and wife, Debbie of Greene; her three sisters, Jeannette Gregoire of Lewiston, Rita Beaudet of Poland and Doris Laneuville of Lewiston; two grandchildren, Justin Stowe and Courtney Barnaby’ and two great-grandchildren, Jane and Eric Stowe. She was predeceased by her stepfather, Antonio Caron. The family would like to send a very special thank you to the staff at Beacon Hospice for the wonderful care given to Alice in her last days. Also, to her sister-in-law, Dorothy and niece, Rebecca for taking the time and coming from Wisconsin to be with the family during this difficult time. Visitation is at Fortin Lewiston, Sunday March 24, from 3-6 p.m. A Mass of Christian Burial will be celebrated on Monday, March 25 at 11 a.m. at Holy Family Church. Committal will follow at St. Peter’s Cemetery. Arrangements are under the care of The Fortin Group Funeral Home, Cremation & Monument Services, 70 Horton St., Lewiston 784-4584.